Julie Schumann was the third daughter of Robert and Clara Schumann. She was a sweet but sickly child and she was considered the prettiest of the Schumann daughters. Johannes Brahms, a close friend of Clara after Robert's death, took a romantic interest in her. However, he didn't make this very clear and only dropped hints to Clara on the eve of Julie's wedding to count Vittorio Amadeo Radicati di Marmorito (b.1831). Julie had met the count, a widower with two children, when she lived in southern countries because of her delicate health. The wedding took place on 22 Sep 1869 in Lichtenthal near Baden-Baden, where Clarea then resided. Brahms, allthough quite sorry, acted as her best man. 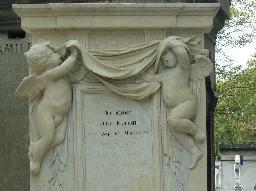 Three years after the marriage she died in Paris of tuberculosis when she was pregnant with her third child. Her husband and two young sons Eduardo (1870-1877) and Roberto (b.1871) were left behind. Her married life had been short but happy, the count loved her and she was popular in Turin. The news of her death reached Clara in Heidelberg on the afternoon of a contralto she would give with Amalie Joachim. She went ahead with it because it would have caused trouble to others if she had canceled it. She had inticipated Julie's death but it was still a blow to her. 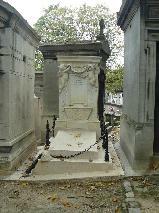 Julie was buried at Père Lachaise where her tomb can still be seen. The grave of Julie Schumann at Père Lachaise, Paris.